The Nittaku Violin has an almost mythical reputation on table tennis forums around the world and is often described as one of the best all-wood blades ever made. I was therefore excited to test out the Violin blade and its recently updated version, the Violin Carbon. Nittaku describes the 5-ply Violin blade as a mid-slow blade that has a soft feel and unique elasticity that is asserted to provide an inimitable type of touch. The 5+2 ply Violin Carbon, on the other hand, is described as a mid-fast blade with a hard feeling. The addition of two elastic and stable carbon layers, in combination with Violin’s unique flexibility, is alleged to result in a noticeably faster blade. In fact, the Violin and the Violin Carbon are on nearly opposite spectrums of Nittaku’s “speed vs feel” chart in their catalogue. Both blades are produced using Nittaku’s hallmark “String Instrument Manufacturing Technology”. The regular Nittaku Violin comes in a simple and relatively large white box with red text. The blade is slightly more compact than usual (156x149 mm) and very thin (~5.3 mm). My specimen weighed a comfortable 85 g. The thick core is kiri, whereas the surrounding plies are white ash. The blade produces a very low-pitched sound when bouncing a ball (1157 Hz), suggesting it is soft and/or slow. The Nittaku Violin Carbon comes in a brown box that is meant to resemble a string instrument. Key characteristics are listed on the front of the box. The Violin Carbon is also compact (155x149 mm) and very thin (~5.4 mm). Given this, I was a little surprised to see that the blade weighs 88 g, which suggests the wood and carbon used in its production are rather dense. The kiri core is not quite as thick as in the regular Violin. The middle white ash ply is followed by a thin FE Carbon layer, and a white ash outer ply that looks slightly thicker than the corresponding ply in the regular Violin. The naked blade produces a significantly higher-pitched sound than the regular Violin when bouncing a ball (1350 Hz), indicating that the Violin Carbon is stiffer and faster, as suggested by Nittaku’s description. For both the Violin and Violin Carbon, the name and characteristics are listed on the front of the blades, whereas the back is without any text. The playing surfaces are exceptionally smooth and beautiful with a vertical wood grain. The handles are kept in very dark grey, almost black, color tones with three red vertical stripes, an oval lens on the FH side, and a golden Nittaku tag at the bottom of the blades. The dimensions of the Violin’s Large FL handle are: length ~102 mm, width 27-33 mm, and height 23-24 mm, whereas the dimensions of the Violin Carbon’s normal FL handle are: length ~100 mm, width 27-32 mm, and height ~22 mm. The handles are smooth and comfortable and almost feel like ST handles. The blade wings are minimally sanded for comfort. The build quality of both blades is impeccable. Testing procedure: I did not seal the blades due to the exceptionally high quality and feel of the surface plies. I attached well-used sheets of DHS Hurricane 3 Neo (2.15mm, black, National version, 40 degree hardness) and SpinLord Waran II (2.0mm, red) short pips on my FH and BH, respectively, using one layer of Revolution 3 normal viscosity glue. I tested the setup over 2-3 sessions, playing a mix of simple drills, practice matches and league matches using the DHS 3 Star D40+ plastic balls. Nittaku Violin - A high-control blade that will win you matches. The Nittaku Violin is the slowest and most controllable blade that I have tested recently, having a speed that is between ALL+ and OFF-. The feeling on ball impact is very deep, solid and ringing, and the blade has a long dwell time and is quite flexible. FH drives feel solid and benefit from the moderate speed and high control. Initially, I struggled a bit with my BH drives due to the longer dwell time and increased flexibility. Once I became accustomed to the feeling, the consistency of my BH drives increased. FH loops can be loaded with spin due to the longer dwell time. The deep, vibrational feeling provides a lot of feedback, which is very useful as it helps determine the bat angle. Consequently, looping against heavy backspin is very easy, producing a high arc with an excess of clearance over the net. FH loops from mid-distance or beyond require greater physical effort due to moderate speed of the blade. At the same time, however, the high flexibility of the blade kicked in at times leading me to overshoot the table. This was particularly evident on power-loops. The moderate speed coupled with the slightly springy feel worked surprisingly well for mini BH-loops and fishing shots from mid-distance using the Waran II pips, as I could land these shots with better-than-usual consistency. FH blocking with the relatively hard Hurricane 3 Neo felt solid and comfortable, albeit not fast. In contrast, I struggled to get the timing and pace right on BH blocks with the short pips. The elastic and only moderately fast response is not typically what short pips player are looking for when having to block powerful loops from high-level players. Unsurprisingly, FH/BH flat hits are very controlled but not very fast. Rather than using brute force, I used the excellent control of the blade to strategically position flat hits and smashes out of my opponents’ reach. The Nittaku Violin excels in the short game, as the moderate speed of the blade allows you to take the pace off the ball in a very controlled fashion. With appropriately soft hands, I was able to land very low arching, spinny, multi-bounce serve returns and drop-shots at an above-average frequency. The feeling on flips, in contrast, was a little muddled. I prefer stiffer and more linear blades for these types of shots. Given the blade’s ALL+/OFF- speed, I also tried to do BH chops from long-distance against loops and this worked very well. The returns were flat, spinny, and consistent. 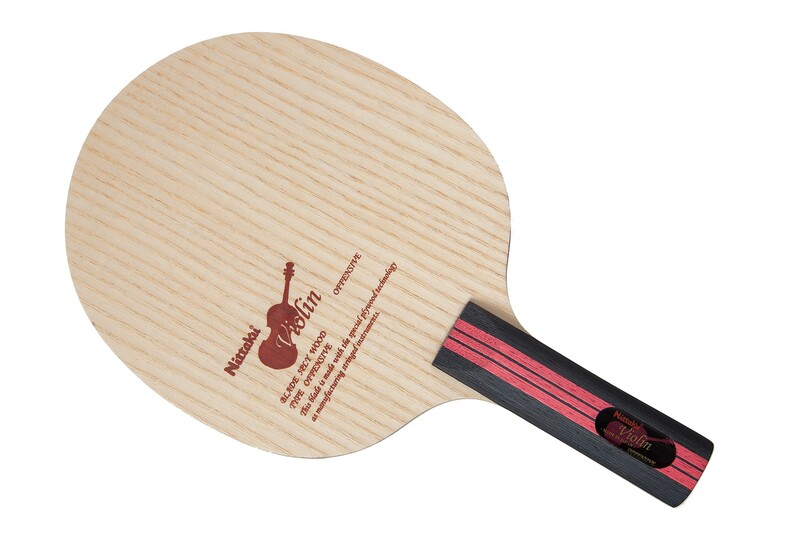 The Nittaku Violin also works well for serves due to the slightly longer dwell time, which allows for generation of high spin levels with excellent control of the ball placement. To sum up, I am intrigued by the Nittaku Violin, especially because I played better in matches with this set-up than usual. The control and feeling on most FH shots (with the exception of smashes and power loops) is very appealing. Soft to medium-hard European/Japanese rubbers are likely an even better fit for the Violin, as this will provide the opportunity for even faster and more penetrating spinny loops while maintaining high levels of control in the short and service game. While the Violin probably is too soft and elastic for aggressive short pips players, modern defenders using short or long pips in the BH should strongly consider trying out this blade. Nittaku Violin: Carbon – A fast and high-arching composite blade. 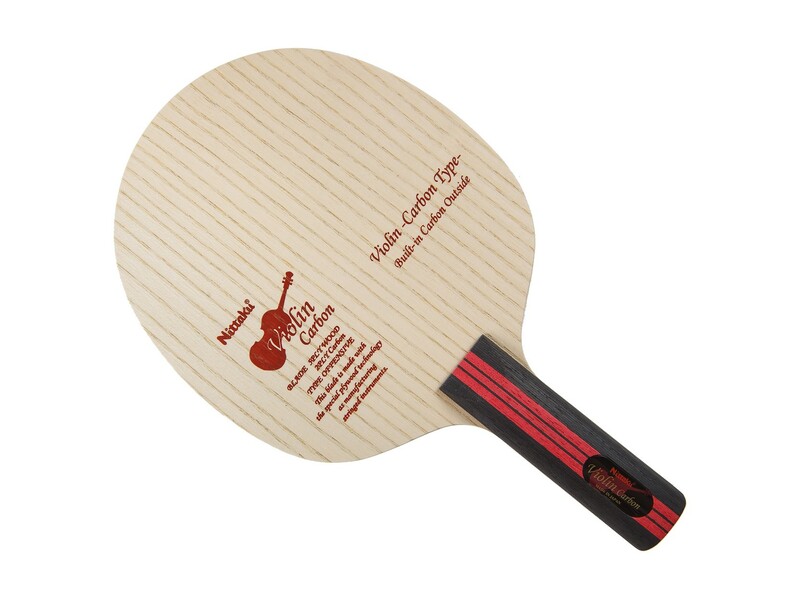 The first couple of FH drives reveal that the Nittaku Violin Carbon (NVC) is a very different blade than its namesake. The feeling upon ball impact is sharp and with few vibrations, and thus very different from Violin’s deep and ringing feeling. The Violin Carbon is also much faster, stiffer, and less dwelly than the regular Violin, which promotes the execution of fast, yet highly controllable FH drives. The feeling on BH drives with the NVC and Waran II short pips combination is similar: sharper, stiffer, faster, and less ambiguous than the regular Violin, but also with a higher probability of overshooting the table. The NVC’s OFF level speed allows for FH/BH drives to be played a couple of steps behind the table. The feeling on FH loops is sharp, yet the blade provides a feeling of embracing the ball and guiding it over the net even though the dwell time is slightly shorter and the arc slightly lower than with the regular Violin. These characteristics rendered it easy to loop against heavy backspin, although again, I had to take care not to overshoot the table because of the blade’s OFF speed. The spin level on slow FH loops is surprisingly high, which likely is due to the embracing feeling. The NVC excels on power loops thanks to its direct and fast nature but its power that must be wielded with respect. BH mini-loops and flat fishing shots from mid-distance are also easy to execute with the Waran II short pips because of the NVC’s power and direct feeling. FH blocking with the DHS Hurricane 3 Neo was reliable and fast, whereas the consistency of my BH blocks was lower than usual. I attribute this to the medium-soft sponge of the Waran II and the thin and fast nature of the NVC, which does not allow as efficient absorption of the incoming kinetic energy as thicker blades. As expected, it was easy to make blisteringly fast flat hits and smashes using the NVC, irrespective whether I used the Hurricane 3 Neo or the Waran II. I was pleasantly surprised to note that the NVC offers remarkable control in the short game and on drop shots, which are low and spinny. Aggressive service returns are facilitated by the fast and stiff nature of the blade, which provides a clear contact point. A surprisingly high level of spin can be imparted on the ball during serves, which likely is due to the white ash outer plies. While I would not recommend it for modern defenders, the NVC still can produce reasonably consistent BH chops from long distance when using soft hands, despite being fast, direct and stiff. In summary, the Nittaku Violin Carbon is significantly faster and stiffer than the regular Violin and caters to advanced players with aggressive game styles. Those who can tame the high speed, will be rewarded with a crisp feeling upon ball contact and the ability to impart a surpring amount of spin on the ball. The NVC worked well with the hard-sponged Hurricane 3 Neo and it probably would also go well with medium-hard to hard European and Japanese rubbers, although the setups will be very fast. The NVC works reasonably well with short pips although its ability to absorb the energy from incoming loops is compromised by its thin nature. All in all, the Nittaku Violin Carbon reminds me the Victas Koki Niwa blade, which also is a great, fast, and direct-feeling composite blade.